There is nothing ruder than someone putting a 'found' object in front of our door. I came home from work last night only to discover a ribbed, navy, mens sweater outside my door. After looking around for potential booby traps, I came up short. 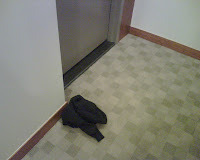 Here's the sweater and it is STILL there. How rude!